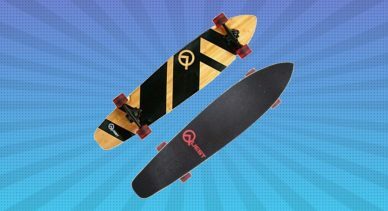 Quest Super Cruiser Review – Is It The Best Beginners Longboard? 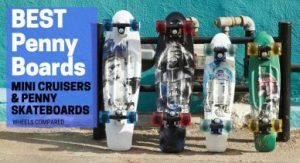 You are here: Home / Skateboards / Longboards / Quest Super Cruiser Review – Is It The Best Beginners Longboard? The Quest Super Cruiser is one of the most popular beginner longboards out there in the market. No wonder it is because of the quality it has maintained over the years. I’ve still got the Quest’s 2014 Classic Super Cruiser Edition in my garage, with a few customizations, so you can bet how good it is. 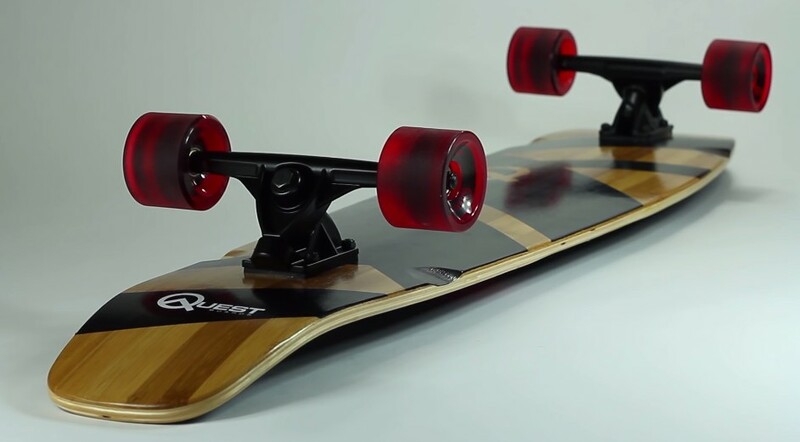 Let’s just get into Quest Super Cruiser longboard’s review. Quest is quite affordable when it comes to cruiser boards. The deck is top mounted and sits on top of the trucks. The Super Cruiser just fits the profile of being the optimum board for getting around town, or as a mean of getting from one place to another. 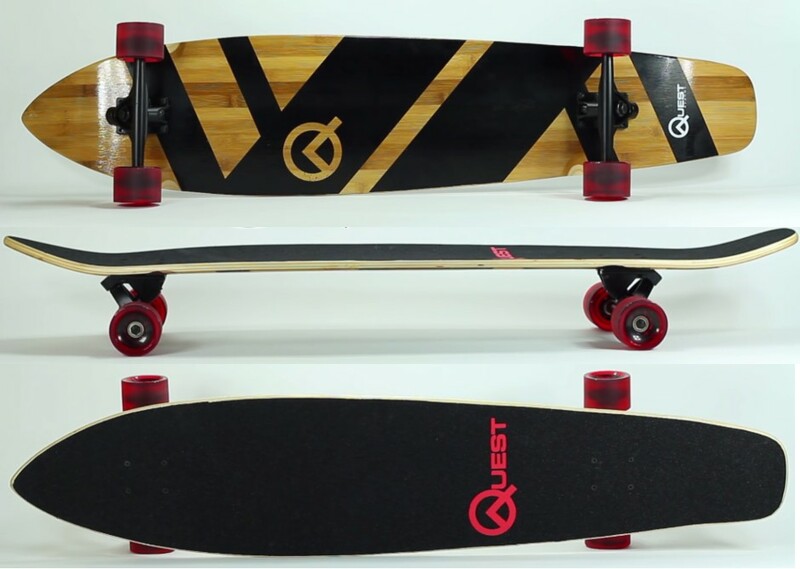 Quest Super Cruiser comes equipped with 7 Ply Super-Flex Bamboo and Hardwood Maple deck that makes the board durable and sturdy. Not all longboards will give you this type of great durability at a cheap price tag. The Quest super cruiser is made by (Made In Mars), who is well known for their designs and they make products 100% on their own by working with some of the best pioneers of the Skate, Surf and Snow Board world. Being a super cruiser the flex of the board is just right enough to prevent the board from cracking or splitting into two. The deck also features a kick tail and nose along with wheels whirl to prevent wheel bite. Quest Super Cruiser features a 44-inch long and 9 inches wide deck. 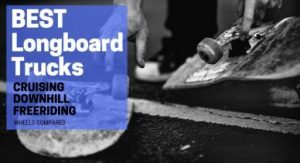 It’s relatively a little longer than other boards which makes it optimum for being a Super Cruiser, but there’s a catch if you are under 5′ 6″ then surely this isn’t for you, so I would suggest you go for shorter 34-inch Quest Rorshack Bamboo longboard version. The Super Cruiser features 7-inch aluminum trucks along with polyurethane 70 mm wheels with a hardness of 80A. The trucks also feature double reverse kingpin bushing for a smooth riding experience. The bearings used are the precision ABEC 7 bearings, but the bearings are slow and might disappoint you. So, you might have to consider upgrading the bearings sooner rather than waiting for them to wear out completely. Other than that for a longboard of this price, the components are far better than average. 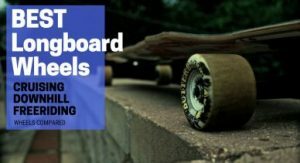 So if you are looking for a pro-style longboard that offers a good affordable price than look no further. For a longboard, it’s quite rare to have this much detailing at such a reasonable price. As a beginner, the 44-inch long length of the board provides you with a stable platform to stand on, and you will easily notice the effects of different foot placements on deck. Other than that when riding the deck, it seems pretty solid and stable. Back when I got it, I used to ride it every single day and the terrain I used to ride on was pretty rough, but the soft wheels handled it pretty well. There was no wheel bite on small pieces of street debris (pebbles, twigs, etc.). Tip: If you are a new rider than I would suggest you tighten the axle nuts a bit. So it won’t go any faster than you can control. But as you learn and get better with skating, you can adjust accordingly as you like it. Let me be clear; Quest is a total beast when it comes to budget boards and when you are starting with longboarding. 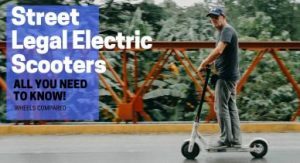 It’s a perfect choice for a beginner that features excellent build quality with an optimum performance where the value for money is just through the roof. So, if you are a beginner, the Quest Super Cruiser is definitely for you. Still, if you need more options, you can hit me up in the comments sections for suggestions. 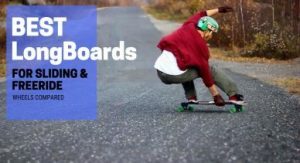 Also, check out these 7 longboards that are best for cruising. Large size makes it easy to balance/helps in learning. Wheels handles rough terrain easily. Some beginner riders might find it a bit too long and a little wobbly in the start.